Frame-O-Rama opened its first store in 1974 in San Francisco’s Russian Hill neighborhood. It was not long before three other stores were opened in neighboring cities: Mill Valley, Berkeley, and Burlingame. 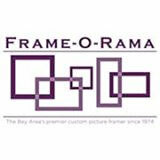 Frame-O-Rama has been custom framing art for savvy Bay Area clients for almost 40 years. We specialize in helping each customer enhance the beauty of their art and express their own unique style. No two pieces of art are the same, and neither is the framing treatment. The final product is always unique and gives the customer a great deal of personal pride. The art of Custom Picture Framing is a collaboration of our customer’s vision, high-quality products, and the creativity and engineering of our highly-trained staff. Our museum mats are pre-cut and gallery frames already built – so most of the labor has been completed up front. This is why our prices are, on average, over 40% less than those found at a typical “custom” frame shop. And we use the exact same raw materials. All that’s left for us to do is professionally insert your photos, posters, and art, which we do in just a few days time, with a 100% satisfaction guarantee. Our elegant collection of all-wood gallery frames were built, exclusively for photograph, in the San Francisco Bay Area, and may be found hanging in local galleries, exhibitions, and museums.For odd and oversized pieces, custom-cut mats & frames are also available at the same low price. SMITH ANDERSEN NORTH is a multifaceted art services space serving the art community of the San Francisco Bay Area and beyond. Our clients include galleries, museums, artists, private collectors, art consultants, photographers, and designers. Our exhibitions showcase the incredible work being made within our vibrant photographic community, with subject matter is as diverse as the artists we serve. Beyond the scope of our photographic services, we strive to support the development and creation of new work through our Artists-in-Residence Program. Whether you are framing a piece for preservation or for display, we can help you with expert design guidance and our unique selection of frames. We work with Artists, Architects, Businesses, Consultants, Contractors, Designers, Galleries and Individuals. Cheap Pete’s Frame Factory Outlet offers an alternative to the high cost of custom framing. With almost 40 years of custom and readymade picture framing experience, Cheap Pete’s combines the convenience of a readymade frame with the expertise of a custom framer, creating a unique look for a fraction of the cost of custom framing. Cheap Pete’s carries a wide variety of readymade frames in all standard sizes, including squares, ranging in size from 4x6” to 32x40”. We offer exceptional values of manufacturers’ closeouts and overstocks many times throughout the year. Our wall of “Gallery Frames” is a Cheap Pete’s customer favorite: these stunning frames, made exclusively for Cheap Pete’s, are exceptional custom mouldings cut-down to standard sizes and sold for a readymade price. All about photo recommends Marin Frames. Since 1985, Michael Thompson Framing has been one of the leading full service custom picture framing companies in the Bay Area. Our showroom is conveniently located in the heart of the SOMA design district, close to all major freeways, with parking right in front. Our clientele includes renowned designers, leading architects, Fortune 500 companies and prestigious art galleries. MODULAR PICTURE FRAMING - Museum Quality. All Wood. Locally made. We’ve created a system of standardized mats and frames that can be interchanged to create a variety of design options. We call this “modular picture framing.” Our museum mats are pre-cut and gallery frames already built – so most of the labor has been completed up front. This is why our prices are, on average, over 40% less than those found at a typical “custom” frame shop. And we use the exact same raw materials. Sterling Art Services was established in 1981 and has evolved into a significant resource for individuals engaged in all manner of visual pursuits and professions in the San Francisco Bay Area and beyond. We're small enough to offer a high level of customer service but large enough to take on ambitious production projects. Sterling is fueled by a talented crew of craftspeople and artists who bring their own experience and understanding of materials and process to fruition in a product they can be proud of. Attention to detail is expressed through an often collaborative process between Sterling and the customer. We conduct our business from a 6400 square foot studio in San Francisco's South of Market district. Our woodshop produces many unique frames and display devices from North American hardwoods and other materials. Our in-house frame designs tend to favor contemporary art, graphics, and photography, and we draw on a wide range of tradespeople and historic reproduction frame makers to widen the available choices. We strive to maintain high preservation standards, and can tailor our products to meet the requirements of any job and budget. We are a full service company and are always researching new techniques and designs. If we don't have it or make it yet, we can often develop or procure it. Cheap Pete’s Frame Factory Outlet offers an alternative to the high cost of custom framing. With almost 40 years of custom and readymade picture framing experience, Cheap Pete’s combines the convenience of a readymade frame with the expertise of a custom framer, creating a unique look for a fraction of the cost of custom framing. Cheap Pete’s carries a wide variety of readymade frames in all standard sizes, including squares, ranging in size from 4x6” to 32x40”. We offer exceptional values of manufacturers’ closeouts and overstocks many times throughout the year. Our wall of “Gallery Frames” is a Cheap Pete’s customer favorite: these stunning frames, made exclusively for Cheap Pete’s, are exceptional custom mouldings cut-down to standard sizes and sold for a readymade price. Since 1980, First Street Gallery & Frame Company has provided the finest in custom framing services. We provide professional, helpful service with quality craftsmanship. Our frame shop specializes in preservation framing using the latest archival materials and the highest quality standards. Our framing experts will also use their years of experience in selecting the finest materials to achieve the best presentation for your special items. In addition to fine art, we can frame 3-dimensional collectibles and mementos.